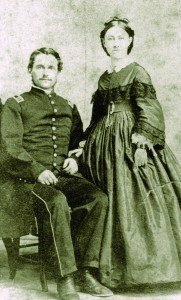 The exhibit focuses on the life and marriage of Doctor and Mary Tarbell of Tompkins County, New York, during the Civil War. The exhibition is presented in conjunction with An Irrepressible Conflict: The Empire State in the Civil War, a 7,000-square foot exhibition commemorating the sesquicentennial of the Civil War. Both exhibitions are open through September 22, 2013. Doctor Tarbell and Mary Lucy Conant met at a very young age while attending school at Groton Academy in Groton, Tompkins County. The two became childhood sweethearts and maintained a steady correspondence during Doctor’s military service. 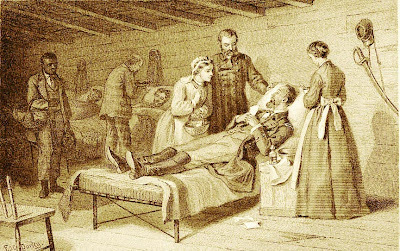 After his capture at Winchester, Virginia, it was feared that Doctor Tarbell was killed. 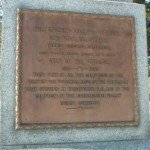 Neither Tarbell’s family nor Mary learned of his fate until a telegraph arrived informing them of his release from Libby Prison. 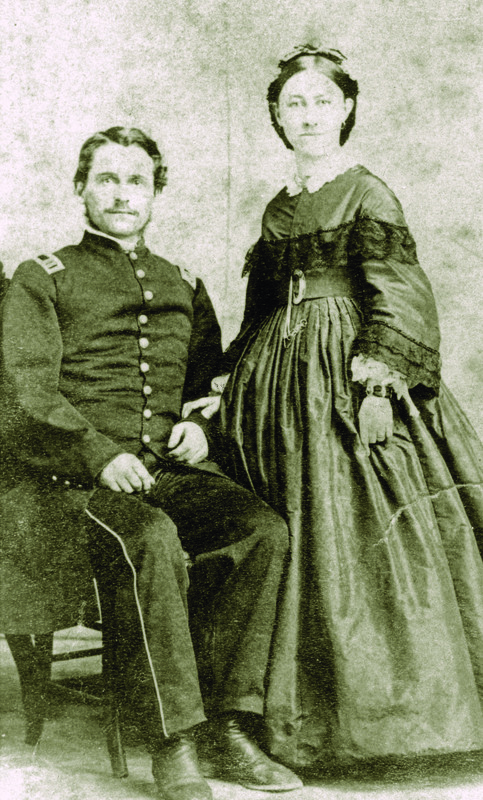 Following his parole in February 1865, Doctor was given 30 days leave during which he returned to Peruville, Tompkins County, to wed Mary Conant. Soon after, Tarbell returned to his unit and served the remainder of the war, finishing his service as a Brevet Major on July 27, 1865. He returned to Ithaca and was elected Tompkins County Clerk. In civilian life, Tarbell became a successful local entrepreneur and worked in the life insurance business. The exhibition, on loan from The History Center in Tompkins County, includes objects from the History Center’s collections and the New York State Library. The highlight of the exhibition is Mary Tarbell’s wedding dress. Nineteenth-century wedding dresses were often practical garments that were typically used for many social occasions. The exhibit also features the Tarbells’ personal items including a Civil War pewter mess kit, letters, diaries, memorabilia, and photographs. 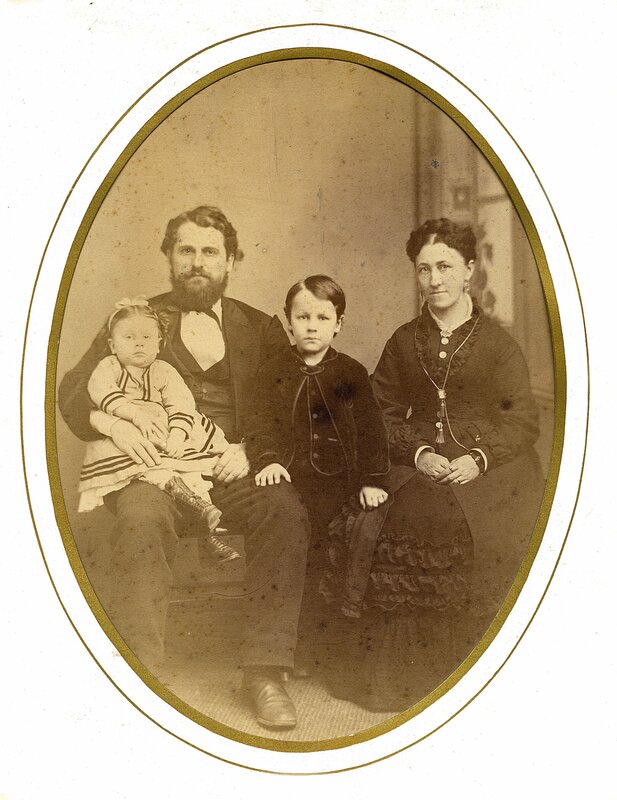 Illustrations: Above, Doctor and Mary Tarbell, taken between 1861-1865- middle, an April 6, 1865 letter from Doctor Tarbell to his wife, Mary (facsimile)- and below, Doctor and Mary Tarbell with their three children in about 1873 (All images courtesy The History Center in Tompkins County). I hope you have included Mary Tarbell’s letters in your exhibit. I hope I can come to Albany to see it. 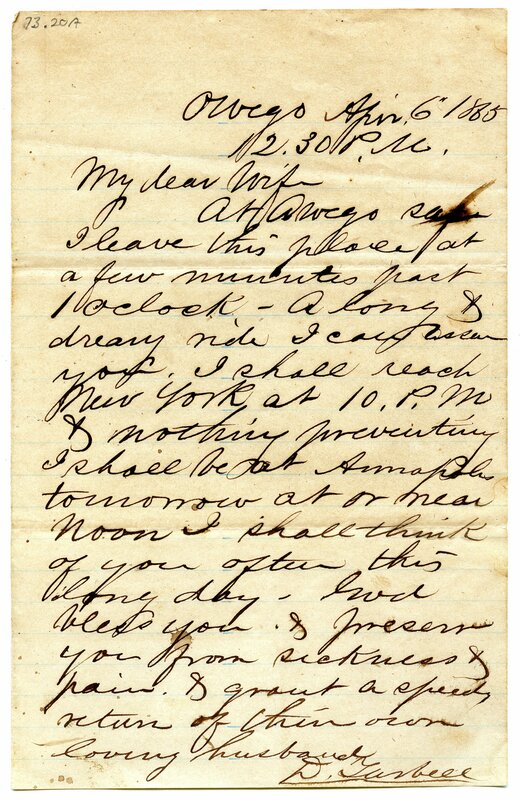 I found her letters in Michigan when I was trying to get Tompkins County Hist Ctr to do an exhibit on the Tarbells. ( http://quod.lib.umich.edu/c/clementsmss/umich-wcl-M-2361tar ) I quit The History Center shortly after that, but not before I had listed most of the Tarbell materials held there. The two sets of letters make a fairly rare collection when put together. 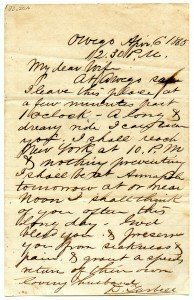 There are lots of Civil War letters, many of them poignant. But there are not a lot of examples where both correspondents’ writings are available. I am glad to see the Tarbells getting attention. You should contact the State Museum. This site just reports on exhibits, it does not install them.